As I stepped out of the Narita Airport, I breathed in the first cold December air of Tokyo and caught a bus headed for Ikebukuro. If you’ve never had the chance to travel to Japan, the hotels are not spacious, but to my surprise the room that was provided for mineral dealers was quite livable. As a passionate twenty-year-old college student it was a huge privilege to visit Japan again, but especially because this trip was focused on minerals. 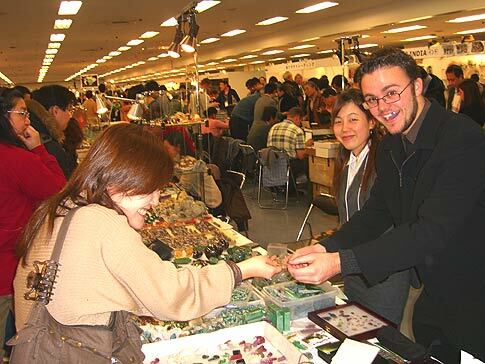 On this trip I represented Pala International at the Tokyo Mineral Show in Sunshine City, Ikebukuro. Will Larson and Sakumi Shimizu with a customer finalizing a purchase. The Tokyo Mineral Show is small but down-to-earth, offering customers a wide range of dealers from all around the world including some familiar and unfamiliar faces. One familiar face, Patrick de Koenigswarter of Miner K, had many fine specimens of painite and other rare exotic minerals from Burma. Charley Mark, a dealer of larimar, was my neighbor who I had never met before and had the pleasure to get to know. Larimar proved to be very popular with the Japanese. Being a small show you may wonder what brought me so far to participate, but that is easily explained with my passion for Japan. Currently I study at Santa Clara University focusing on Asian history and Japanese language. This show allowed me to travel once again to a foreign country I love. I also went because I was offered a deal I could not refuse—to share a hotel room and table space with a good friend and second father Nikolai Kouznetsov. I must say it was quite scary doing a show alone for the first time in another country even though I was splitting a table with Nikolai, because business-wise I was on my own. 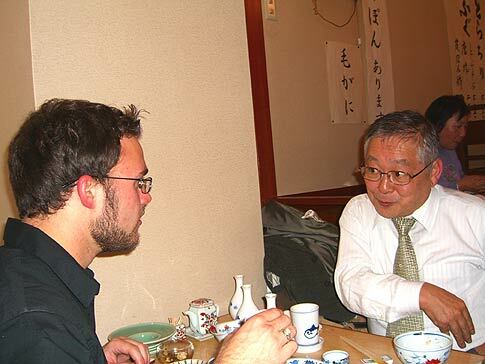 The Japanese are very tough business negotiators and it was a great experience to learn from them. Set-up day was all hustle and bustle for me as I completed half of my total earnings on that first day alone. Many of the dealers at the show were very interested in the phosphophyllite I had. I sold a very fine thumbnail phosphophyllite to a nice Japanese gentleman who beat me gently down to my final price. The Japanese customers seemed interested in the same types of minerals: small, aesthetic, colorful with perfection. Any minerals of these qualities I sold very easily, while those of larger size seemed much harder to sell. 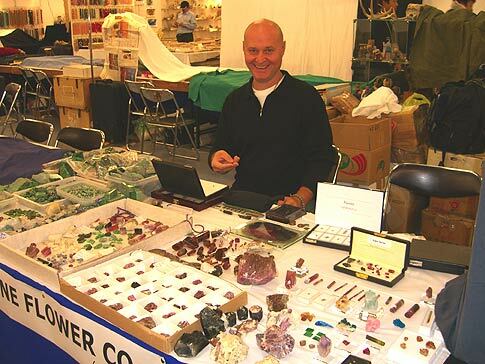 Nikolai Kouznetsov working the Tokyo Mineral Show. After set-up day, Nikolai and I decided it would be best to hire an assistant translator since the Japanese I knew was mostly unhelpful during business negotiations. Sakumi Shimizu, a Waseda University student, worked very hard translating business transactions and customer questions. The general public viewed and handled the minerals and asked many interesting questions that I have never received before from other markets I have worked with. The “power” of each mineral was probably the most popular question asked that I could not answer; unfortunately I am quite ignorant of the power of minerals, but I learned that rhodochrosite’s power concerns love. So if you or anyone you know needs help with love, buy a rhodochrosite. It would be my pleasure to sell you one. Another plus to working at the show in Tokyo was its location in Sunshine City, Ikebukuro, at the northwestern corner of the important Yamanote train loop, which connects Tokyo’s major city centers. The show is adjacent to the shopping mall and is near many fine restaurants. After work, getting good food was not a problem, at least for my own palate. I love Japanese food and finding a good restaurant in Ikebukuro was not difficult. I ate at many wonderful noodle shops, sushi bars, and Korean barbeque restaurants which kept my stomach happy night after night. I experienced one of the best meals of my life thanks to the Moriyama family. (Moriyama-san is a well known fluorite collector and has a fine collection of fluorites from all around the world.) They invited Nikolai and me to a lovely little sushi bar in Nakano, southwest of Ikebukuro, where we ate the best tuna sashimi of my life and enjoyed the many types of sake. The color of Japan, for minerals, would have to be all light shades of blue. Everything with this color was very popular and sold well. As I mentioned before, larimar sold well; I also saw some dealers selling paraiba tourmaline, sapphire, blue fluorite, and my own phosphophyllite. The last day of the show was another big hit day, as was the first. I managed to sell all the remaining cut phosphophyllite of small size, from 0.2 cts to 0.5 cts. It was nice to go out with a little bang in the morning and it allowed me to visit Waseda University, somewhere I might like to go to study in Japan.